All About Sports Cards: Panini America Signs A New Multi-Year Deal With MLBPA. Josh Hamilton Set To Autograph Cards. Panini America Signs A New Multi-Year Deal With MLBPA. 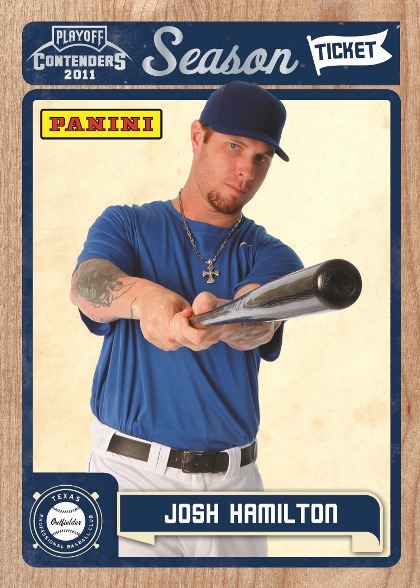 Josh Hamilton Set To Autograph Cards. Panini America and the Major League Baseball Players Association (MLBPA) announced today a multi-year trading card agreement. This makes Panini the only trading card company with licenses in all four major sports, Baseball, Football, Basketball and Hockey. The first Panini/MLBPA cards will debut with the December release of 2011 Elite Extra Edition, followed by 2011 Contenders Baseball, which will include the first Panini Autographs of Josh Hamilton. If you're not going to have team logos on it, don't bother. Yes, I'm a card snob.